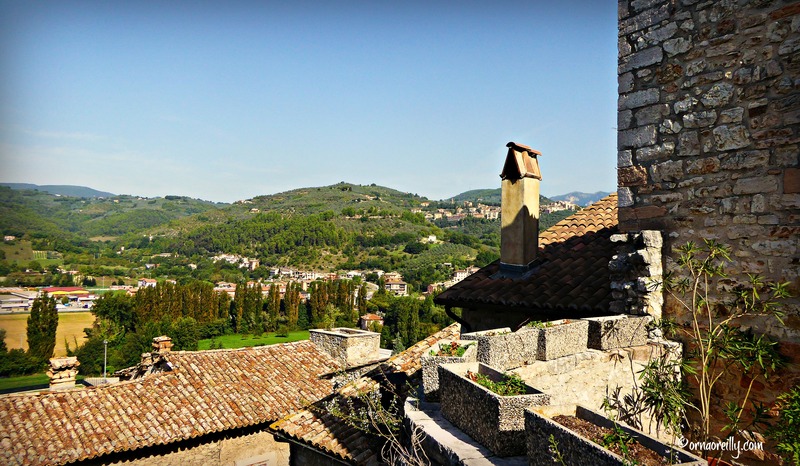 Umbria: famous for its mountainous beauty, wonderful agriturismi (farm-tourism with food produced on site), black truffles and olive oil, is also home to many quaint medieval towns nestled in the hilltops. For those of you who long to wander through centuries-old streets while the bells toll in an ancient campanile (bell tower) and visit medieval churches full of beautiful frescoes, then Arrone is the place for you. Justifiably proud of its designation as I borghi piu belli d’Italia (one of the most beautiful villages in Italy), Arrone is a quaint medieval town about half an hour’s drive from the famous Marmore Falls close to the city of Terni. Perched on a rocky hilltop overlooking the Valneria (Nera River valley), the name Arrone comes from the eponymous family who, we were told, originally hailed from Lombardy. A few months ago, I was invited to Terni, Umbria, as a guest of GAL Ternano, along with Tom Weber, The Palladian Traveler, to participate in a familiarisation trip of the area. 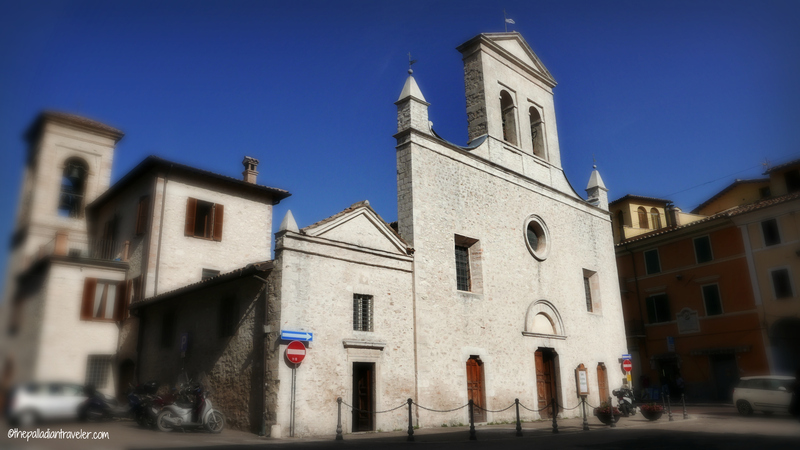 Bright and early, on our first morning there, we were brought to see the two famous churches of Arrone. First stop was at the 15th century church of Santa Maria Assunta (Saint Mary of the Assumption). Walking through the vast door, I was overwhelmed by the vibrant colours. I marvelled at the priceless glazed terracotta statues which date from the 16th century and paused to gaze in admiration at a painting from the school of Caravaggio hung in a magnificent frame beside the main altar. Church number two, was dedicated to San Giovanni Battista (St. John the Baptist) by the Arrone family who were devoted to his memory. It is situated beside the castle in the hilltop area known as La Terra, which still retains a great deal of the original fortified town. 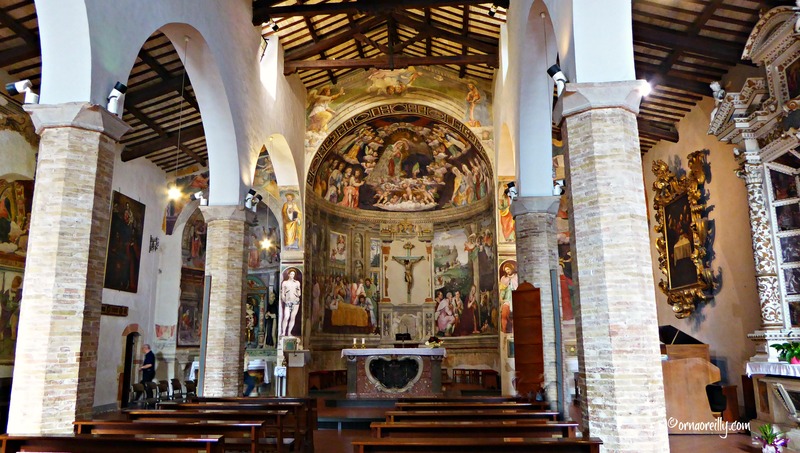 It is lavishly decorated with carefully preserved frescoes. 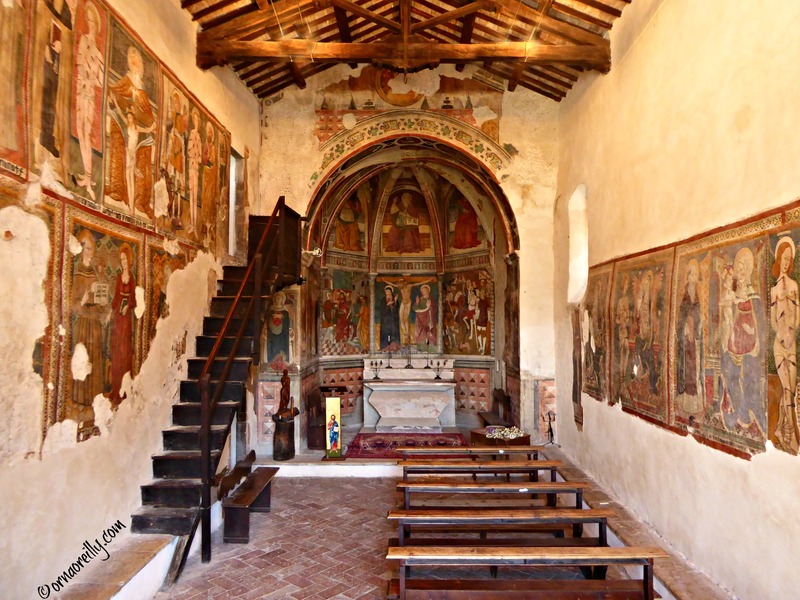 We were told that these frescoes date from the 13th century and are from the Spoleto School. There is, apparently, a special feast day dedicated to San Giovanni annually on 24th June. Next on the agenda was a coffee break, which was served on the terrace just outside the door of the little church. We were treated to homemade fruit-filled crostata and little cakes filled with fennel seeds. Leaning on a wall overlooking the valley, as I ate the soft pastry and sipped the excellent coffee in the warm September sunshine, I experienced one of those feel-good moments which are so special to Italy. Our coffee break was followed by a leisurely stroll through the narrow medieval streets……. …..and where I photographed many of the diverse and interesting front doors. 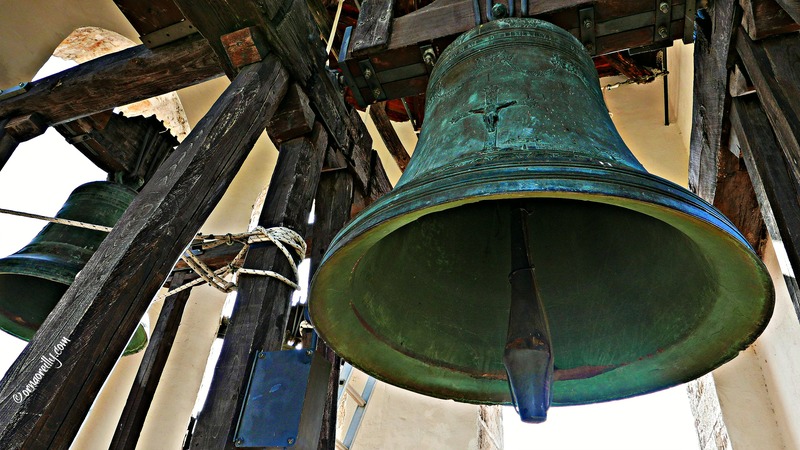 As we ambled along taking photos and chatting, the bells suddenly began to toll from the tower of San Giovanni Battista, the sound echoing across the valley. 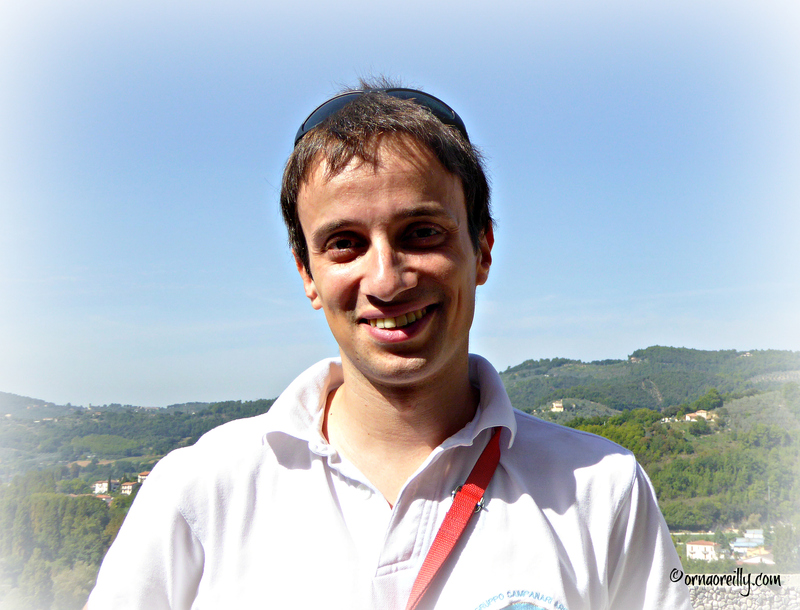 Arriving back, we were just in time to meet the young bell ringer himself: Riccardo Palmieri, who informed us that he is a member of the Gruppo Camparano Arrone (bell ringer association of Arrone). As we motored out of the pretty little town of Arrone and back towards Terni, my only lament was that I was unable to stay there longer to savour its sights and sounds to the full. 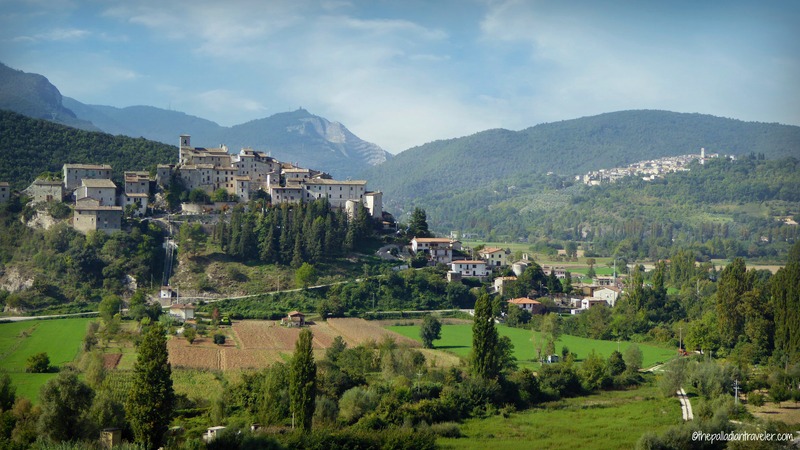 For full information on Arrone and how to get there, click HERE. Orna, how gorgeous! I love that second church, but everything you posted it lovely. If I were keeping a list, this would be on it. I hope you have a blessed and peace-filled Christmas. What a treasure trove of great photos and excellent narrative. Two thumbs way up this time, Orna. Brava!